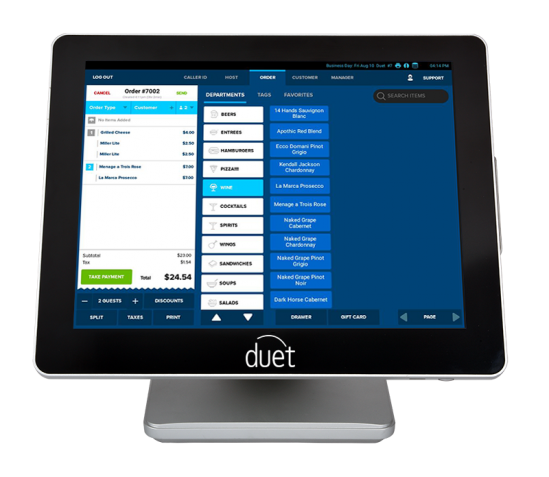 Contact us today to learn how you can add Duet POS to your business! A local reseller will deliver, install, and configure your system, allowing you to focus on what’s important – your customers. Software features and functionality to support your business with high-end hardware for the reliability you need. View reports online, make changes to your menu remotely, and manage your employees from anywhere. The benefits of the cloud such as real-time reporting with the advantages of a local system including faster speed. orders, whether you need to transfer tickets to other users, change tables, split checks, add discounts, update gratuity and taxes, or handle various other tasks. Easily set up and customize coupons, specials or other discounts. Discounts can be manually entered or can be automatically calculated based on day, time or items ordered. occupied, which are vacant and how many people are at each table. Quickly view customers’ order history and personal information. Great for loyalty programs or for serving the “regular”. Add, edit or remove menu items in real-time with a simple and intuitive interface. Organize your menu items, categories, choice sets and modifiers to suit your restaurant. via an Android tablet for a dramatic increase in efficiency. Accept orders through your website with a customized and branded menu that integrates seamlessly with your POS system. everything directly through your Duet POS system via an Android tablet.